First Sentence: The story that follows is one I never intended to commit to paper. Reason for Reading: The premise of the novel intrigued me from the very first time I heard about it. I knew that this was a book I needed to read. I put off reading it until the mood was right—and because I wanted to first read Bram Stoker’s Dracula, which I had been told would provide a little background. Comments: As is already known, reading is a passion of mine. I enjoy a good story, stepping into the lives of the characters, visiting familiar or completely unknown places, traveling through time, and taking in experiences through the written word that I most likely will never experience in my own lifetime. Through books, my mind and heart are opened to new knowledge and perspectives, whether in fiction or fact. 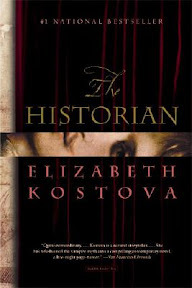 So far this year, I have had the privilege of reading many wonderful books, books that I finished and thought, “Wow!” And then I come across a book like Elizabeth Kostova’s The Historian. A simple “wow” does not do the novel justice. I am not even sure a triple “wow” would cover how I felt reading this book. Elizabeth Kostova has taken a popular myth, that of Dracula, and added new life to an old story. The Historian is the story of a young woman’s discovery of a dark family secret, told through her voice as well as that of her father’s and his own letters and that of friends. It begins when our sixteen-year-old narrator finds a mysterious book hidden on the top shelf in her father’s study. Inside there is a woodcut of a dragon. She also finds several letters that suggest danger, which further peaks her interest and she soon asks her father to tell her the story behind them. Reluctantly, he does so. As the mystery unfolds, the young woman discovers her family’s connection to the infamous prince, Vlad the Impaler, more popularly known as Dracula, who ruled during the late 15th century. As the characters travel through Europe, they are on an adventure that proves both enlightening and very dangerous. The story goes back and forth in time as the various stories—that of the narrator’s father, mother, Dracula’s and her own—come together. The author weaves fact with fiction, using her own imagination as well as her thorough research into the history and folklore of the various regions visited in the novel and that of Vlad Dracula. Ms. Kostova captured the political tensions of the times, which was essential because the setting of the novel plays an important part in the story. The writing is elegant and beautiful. I was lost in the prose as soon as I began reading and held in suspense with each chapter. And when I was not reading the book, it was never far from my thoughts. I longed to return to Ms. Kostova’s world when forced to stop because of work, sleep or the usual daily responsibilities. Perhaps it is my interest in history and other cultures that fascinated me most about The Historian, or it could have been the many mysteries the novel offered. It also could be several of the characters, whose life stories intrigued me and whose intelligence, unfailing curiosity and courage won me over from the first introduction. I have no doubt that it is a combination of all of these factors. This is by far the best book I have read in years and has earned a place among my all time favorite novels. The Historian is a novel that will definitely be worth re-reading, and with each new reading, I am sure something new will be discovered. Favorite Part: I most loved the author’s descriptions of the various cities and countries that were visited. I felt like I was right there with the characters every step of the way. I loved visiting the various libraries and monasteries. It was all so fascinating to me! I think though, if I had to pick, Paul and Helen’s time in Istanbul is my favorite part of the book. That is where I met Professor Bora and his wonderful wife. But then, I also enjoyed my time in Bulgaria, meeting Stoichev, and his niece. Oh, how I would have loved to spend time listening to the stories he could to tell! Miscellaneous: This is the hundredth book I have read this year. I am amazed I managed to get this many books read, and it’s only October. I purposefully chose to make The Historian my hundredth book at the beginning of the month, and I think it’s a well-deserved spot. I bought the hardback version of this book last year when it came out, knowing I wanted to read it. As it turned out, it was not until the paperback version hit stores that I found my way to it among my TBR shelves. I talked my husband into letting me buy a copy of the paperback version—I figured the size would be more convenient to lug around to work and back, not to mention easer to hold when reading in bed each night. Sounds so good!! AS I said on the thread at ABH I literally bought this book the first day I saw it in the shops....and haven't even read the first page. Have to bump it up the TBR pile. Congrats on making it to 100 books for the year. I am rapidly closing in on my reading goals for the year!! Thrilled to hear how much you like this book! I bought it recently and it is on my 2007 TBR Challenge list. I can't wait to get started on it - sounds wonderful!! Thanks for the great review!